These gold Claddagh cuff links feature a chain link shank. Sorry, these Irish cuff links are now sold out. These Claddagh cuff links have been hallmarked 9K goldby the Irish Assay Office at Dublin Castle in Ireland. 9ct gold is .375 pure gold and was at one time the Irish standard for export to the US. 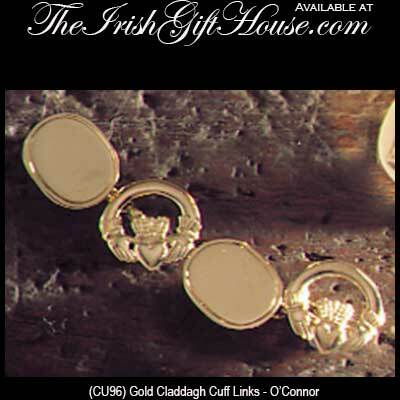 These 9ct gold Claddagh cuff links are a round shape and measure 1/2" in diameter. The chain link Irish cuff links feature a 5/8 long chain link shank and are gift boxed with a Claddagh legend card that is complements of The Irish Gift House. These Claddagh cuff links were made in Ireland by O'Connor Jewelry.